Doing the kind of cases that I do, I often have a need to instruct various ‘experts’ to do assessments/prepare reports. This can be at any point in the SEN process, from conducting an assessment on a child or young person to see if he or she has difficulties in a particular area, to appearing as a witness on their behalf at a SEND Tribunal. 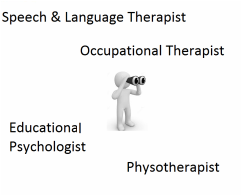 I normally instruct Educational Psychologists (EPs), Speech and Language Therapists (SaLTs), Occupational Therapists (OTs) and Physiotherapists (PTs) (and also occasionally instruct Teachers of children with a Hearing Impairment (THIs) or a Visual Impairment (TVIs). Although I sometimes meet/use new people, every few years I like to widen/update my ‘expert’ list. So, if you are one of the above working in independent practice and would like to work with me, then I would be grateful if you would email me directly with information about yourself, together with a copy of an anonymised report that you have prepared (preferably for a SEND Tribunal appeal) and a list of your Terms & Conditions (e.g. charges etc.). I will then be in touch with you after considering everything. Even if this is not you, if you would like to recommend an ‘expert’ to me (e.g. you are a parent of a child with SEN and have used somebody who impressed you, or you have worked with someone professionally and think that I should know about them), then please also email me directly with their name (and details if you have them) and I will contact them myself. My thanks in advance for your taking the time to help me do this.